A new school year means new teachers and classes, cooler temperatures and the start of fall sports. While coaches, parents and students are all excited for sports to begin, a major concern on everyone's minds is how to keep student-athletes safe while still enjoying the game. This year, sports medicine doctor Emily Dixon with TriHealth wants to emphasize the need to protect student-athletes from concussions. Here's what all parents, students and teachers should know. The first thing you need to understand is how the skull functions to protect the brain. "Your brain floats in a bowl of fluid," Dr. Dixon explained. "Think of it like an egg yolk in a shell." Shake up an egg and you might not damage the shell, but you can damage the yolk. This is why Dr. Dixon says athletes and coaches should not rely on helmets as their sole protection against concussion . "Helmets prevent neck injury and skull fracture," said Dr. Dixon. "But they aren't the best protection against concussion. If helmets prevented concussions, there would be no concussion problem in football." Concussions are caused by rapid head movements which can result from impact or whiplash, so it's important to watch for signs of concussion whether the athlete has direct contact with an object or the ground or not. 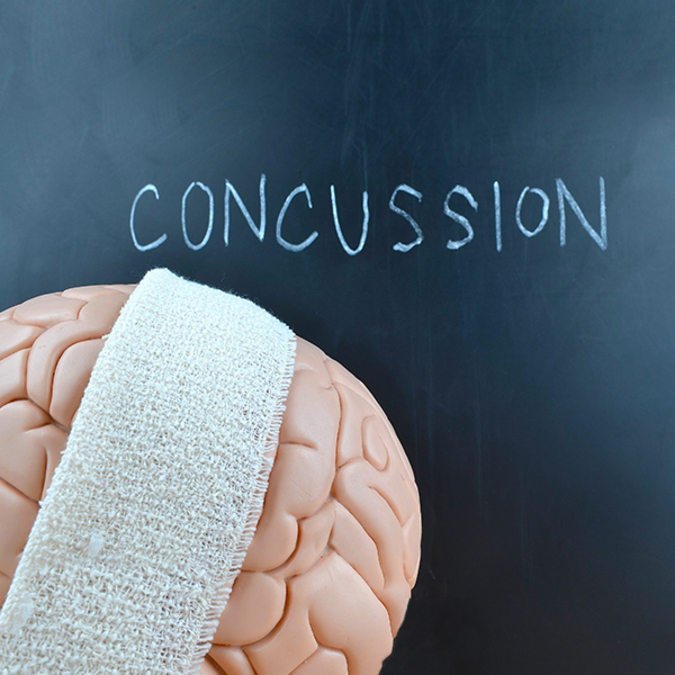 Side effects of a concussion can vary widely as no two brain injuries are the same. TriHealth experts explain that possible symptoms could include changes to touch, taste and smell; difficulty with communication and understanding; changes to memory and reasoning; personality changes; anxiety; depression; and social inappropriateness. In Ohio, if a trainer, coach or referee suspects a concussion, they are required to pull the athlete from the gain for medical evaluation. While the effects of a single concussion may heal without long-term effect, having multiple injuries over the course of months or years "can result in cumulative changes in thinking sensation, language or emotions," says TriHealth. Research has found that people who sustain recurrent concussions are at higher risk for developing epilepsy, Alzheimer's disease, Parkinson's disease, permanent brain damage and death. As general awareness of concussion risks have increased over the years, sports agencies have taken steps to enact rule changes that make the field of play safer. Dr. Dixon listed a number of recent changes to sport rules, including one handed down by the NFL saying players can have no first contact with helmet. In the NHL, players should not attempt blindsided hits or make any movement that brings both skates off the ice. USA Soccer has ruled that children under age 11 cannot head the ball. These and other guidelines help keep players safe. Other prevention techniques can include ensuring athletes are healthy enough for gameplay and an emphasis on building core strength and neck strength during training to help support the player's head. An important step forward in understanding and treating concussions has come with the development of a new test known as ImPACT (Immediate Post-Concussion Assessment and Cognitive Testing). "This test can help diagnose concussions and offer another toolkit to sports medicine professionals as they help ensure athletes are ready to get back on the field," explained Dr. Dixon. The ImPACT test works by running students through a 45-minute "pre-test" which sets a baseline for their normal cognitive functions. Should the student-athlete later sustain a concussion, the test can be repeated to evaluate cognitive changes and determine when he or she can return to playing. TriHealth employs certified athletic trainers who can administer the baseline test for free to participating school athletic programs. While the risk of concussion is a real concern for many athletes, Dr. Dixon reminds parents and students that the benefits of athletics are real and measurable, as well. She said studies have shown that girls who play sports are less likely to have unplanned pregnancies and more likely to graduate high school. Both male and female athletes are less likely to do drugs than students who don't play sports. "Sports are humbling," Dr. Dixon said. "They teach important life skills, social skills and leadership skills." This is why Dixon recommends students, parents and coaches consider the whole picture when determining a student's future athletic participation, consulting a sports medicine professional when necessary. For more information on how to prevent concussions and important resources on how to evaluate their side effects, contact or visit the TriHealth Orthopedic & Sports Institute.